I’m thrilled to announce the launch of the Secure Site Setup Webinar, which will be on Thursday, July 20th. You’ll get to see a site set up and secured from scratch. Nothing is hidden, and no steps are skipped. Site security is a must-have skill for designers and/or they need to know how to properly vet a webmaster to partner up with to provide this service. And that’s primarily who will get the most from this webinar. But, I’d like to invite all site owners to have a look at the promo video too. Be sure that your designer has all these skills, and see how it’s impacting your bottom line if they don’t have them, and you don’t know to ask for them. I sent emails out to my Webmaster Training members on Saturday. And I sent emails out to BlogAid News subscribers on Sunday, both with big discounts. Loyal followers get the best perks!!! FYI, BlogAid News is my newsletter. I only send that out when I’ve got breaking news and announcements so you can jump right on major site site stuff and special discounts and such. Tips Tuesday is my weekly podcast and post and live video recap. I’ve heard several folks refer to that as my newsletter. Nope, just a post. When you opt in to BlogAid News, there’s a little checkbox to receive my posts via email too. So you get both. And, you can control the subscription on both too. Last week I mentioned two site audit projects that were just returning from my fave fix-it guy Makis at FixMyWP. They had to be squared out from the root up before I could even do the audit. And we’re merrily rolling along on those now. But, we hit a snag on the really big site with huge traffic that I was about to convert to HTTPS. Turns out that we uncovered lots of issues at the host. It’s on a managed VPS, but they weren’t keeping things updated. So, we’ve postponed the conversion while we’re working through those issues. You know, sometimes your site and biz just grow bigger than you think, especially with hosting and such because it’s sort of invisible to you. And it often takes trying something new to uncover hidden issues with it, like your PHP version being too low, or other security and performance measures that better match your site’s functions, traffic, and conversion goals now. Or discovering that you have egregious security holes simply because a core WP file was installed back in 2009 and hasn’t updated since. That’s what a site audit helps you find. So, if you’ve had your site for years, maybe it would be a good idea to bring it in for a checkup, and get it brought up to current standards. This past week I’ve also had conversations with other big money-making site owners who tell me their peers don’t take any measures to ensure their sites are in top shape. One told me she had a buddy whose income has dropped to 1/3 of what it was a year or so ago. He’s working just as hard as ever and making way less, like $100,000 less. Folks, that’s how much things have changed in the last 2 years. You can’t afford to keep doing business as usual. My money-making clients, who are serious about their success, read everything I put out and sign up for every service and class I offer. They know it’s the only way to keep their site ahead of the curve. There’s just too much competition for eyeballs now to do business as usual. We can’t get away with ignoring our site tech, SEO, speed, security, or marketing techniques. It’s evolve or die when it comes to running a successful online presence now. I’ll tell you how else I know why more mature site owners better get with the times. I have a whole new crop of Millennial clients who are super eager to try all the latest new things. And, they are being super smart to get started on the right foot with their site. They’re investing in their success right up front and saving themselves years of try-this-try-that and avoiding the rip offs of hiring site help and design from webmasters who are not up on the latest skills and don’t offer full site help, like security, performance, SEO, and content marketing that has a purpose from day one. I have one Scratch to Published client right now that is going to launch with a bang and has a content marketing plan already in place for getting where she’s going as fast as possible. I would not be surprised to see her make money in the first month. I had a consult with one of my site audit clients yesterday. They run a high end dental office and got a site through one of those niche design firms for local professions like this. There are niche site agencies for lawyers and chiropractors and such too. In fact, I helped the biggest chiropractor in San Francisco launch one after he retired from his franchise. Now, this client did have some limitations with what she could do on their setup, but we were able to improve the site to the point that she is now getting more traffic and folks are staying on the site longer too. In other words, her investment paid off immediately. And here’s how it’s paying off today. She has outgrown what that agency can do for her and she’s ready to make the move to a self-hosted site where she has full control over it. I was thrilled to hear her say that the education she received during her site audit and subsequent fixes, most of which she did herself, gave her the insight to see why she had to leave that site agency due to their poor SEO practices. And, she was empowered with the right questions to ask of potential new designers. She walked away from all of them because they didn’t know about security, performance, SEO, and HTTPS. Plus, they were directing her toward bloated site builders, and she knew better than to get roped into one of those. These are all things I teach in the Webmaster Training courses. So, she immediately returned to me and we’ve made a plan for getting her site redesigned on her own theme, and then moving her to her own hosting. And all the while we’ll be protecting her security, performance, and SEO along the way. In other words, her investment kept her from getting ripped off and from destroying all the hard work she’s already put into the site. That just makes my day!!!!! And that’s why I’m in this end of the business – to help site owners grow and avoid heartache and rip offs. This is a PSA to give you a heads up about some of the badges and videos and images you’ll be seeing all over the web on July 12 so you don’t think the entire internet got hacked. It’s the Net Neutrality Day of Action to protest the upcoming FCC ruling that could give your ISP the power to throttle your internet access. Some websites will be featuring popups that make it look like you need to fill in a form to access the site. There are other sites and organizations backing this protest. I urge you to make your voice heard about it, else the internet could both slow down and get censored by your Internet Service Provider. And we can’t have that. I’m delighted to report that there has been significant progress in the past week on correcting the Text Widget Meltdown in WP 4.8. However, I’m not thrilled with the proposed fix they seem to be leaning toward. I’ve got a link for you to the trac ticket where the bug was reported, if you want to see where they are with it, among 100 other comments and opinions. And that’s the only link I have to share with you because they still have not updated the 4.8 known issues post about it, which is why I didn’t think there had been any movement on it at all. If it had been reported there, it sure would have saved a bunch of folks headaches and wishing they hadn’t updated. From what I can tell, there will be a 4.8.1 alpha release for testing the new fix. I’ll be checking that out when it’s released and reporting the news to you. I’m thinking it will be any day now, as they are aiming for the last week in July for the public rollout of 4.8.1. The folks at WPMU Dev have a review on their first look at the Gutenberg Text Editor. And I think this assessment pretty much sums up their take on it. It was another reviewer’s comment, pleading not to include this in the core. They say it’s promising, but a long way from being ready to implement. They also point to a post from Matt Mullenweg that Gutenberg may show up as early as WP 4.9. That’s not the way I read Matt’s post. It seemed to me he said that they can make a promo for the Gutenberg plugin in the next 4.8.1 release, maybe. And then see if Gutenberg is ready to include in the 5.0 release after a lot more testing. I think even putting it in 5.0 is wildly ambitious for this level of change. It will basically turn your workflow for creating a post on its head. One of the main, not-ready-for-prime-time caveats mentioned in the WPMU Dev post is the inability to copy/paste your content in from another source fully and easily. That would kill my workflow, as I write all posts on my Chromebook in Google Drive. I don’t have much formatting, but if I lost it all, that would be devastating. And being forced to deal with content blocks for every little thing would be a nightmare. Yep, those would get their own content block. The WP devs are making changes to the new text editor so fast that I’ve held off making a video tour of it because that’s super time consuming and it will be obsolete in a week. So, please do make use of all the links I’ve been sharing in Tips Tuesday, including the ones from last week to the online tester, so you can get your own look at how Gutenberg works. I’ll do a video tour when the dev work settles down a bit, or when it’s getting closer to being put into a release. Links are the backbone of SEO. And most of you know how much backlinks from high quality sites are worth. But your internal links, pointing to more of your content, are a big SEO deal too. And, what you link out to is a big SEO deal as well. That’s why Yoast has included a link counter in the latest 5.0 version release of his SEO plugin. Now you can look at your post or pages list and see new icons over on the left for both internal and external links. You may remember in another recent update he put a link checker in the Content Analysis section to help remind you to create more links in your content, even to more of your own content. This latest update is a natural extension of that focus on just how important links are. Right behind the announcement post for the new link counter, Yoast published a post on how to use it and make the most of it. That includes finding what they call “orphaned articles” or ones that don’t have many links pointing to them. And of course, they tie all of this into making better use of the new Cornerstone Content feature in the premium version. What do you think of the new link counters? Feel free to leave a comment on the blog or anywhere you see this post online. In the last couple of Tips Tuesdays I’ve shared some super posts on repurposing your content. It’s the best way to get more eyeballs on it. So, you may be wondering whether you’re going to run into duplicate content penalties by doing that. Nope! Don’t worry about it. That even includes syndicating your blog posts word for word on other platforms. Go read this super guest post by Ann Smarty on Denise Wakeman’s site about how to properly repurpose your content. She even gives specific examples of articles she has repurposed on multiple sites. Very much worth reading and doing. If you’re looking to do an SEO or content audit on your site, you may want to check into this crawler that you can download and run from your desktop. I really like the Screaming Frog crawler too. Both of these have similar limitations in how many links they can crawl on their free versions. 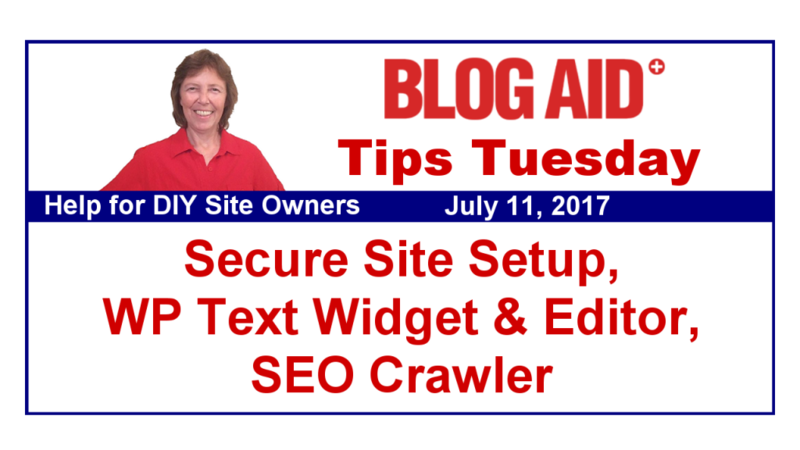 And do be aware that both exact a load on your site when they are crawling. So do it at an off-peak traffic time. The little free Let’s Encrypt SSL certificate has hit a pretty major milestone. It has officially passed the 100M install mark. When you think about the fact that they only started about a year and a half ago, that’s stunning. And I have to wonder if they got to that mark so quickly from so many hosts now installing it on all new accounts. When EIG hosts like Bluehost and HostGator finally start offering them, it will really go through the roof. Plus, they announced that they will be offering wildcard certificates in 2018. Those will cover an unlimited number of sub-domains. I can definitely make use of that here on BlogAid with all of my membership sites for the BlogAid Learning Center and Webmaster Training. Right now each one has its own certificate. I want to thank webmaster and designer Michelle Phillips of Codefetti for bringing this post to our attention. I saw it on one of her Facebook posts. That’s a great place to follow her. I’m hearing more and more of my webmasters asking and talking about Google Tag Manager now because more and more SEO folks and clients are advising to use them. There’s a nice post from one of Yoast’s developers about how to add rich snippets to your site in the form of JSON-LD structured data, and doing it all with Google Tag Manager at the heart of it. Definitely a webmaster level thing, so go geek out guys!! And if you’re wondering what rich snippets are and how your site can make use of them, Yoast has a post on that too, which covers the basics. The example they give is probably one of the most common types of rich snippets, which is a star rating system on a recipe. There are tons of plugins that can help you implement that on your site without coding. Just be careful that they don’t spew their structured data code on anything but your recipe posts. Google sent warning emails to a bunch of site owners over that a couple of years ago. Folks either turned off the star rating and/or that issue has been fixed in most of the plugins. In my head-to-head caching test post I reported that the caching that works best for your site depends entirely on which type of host server you have. Not checking the host server type and implementing generic tutorials is one of the reasons you hear so many uneven reviews of the same caching plugin too. Lack of knowledgeable user setup is another reason results vary. I’ve seen site owners install plugins like WP Fastest Cache and then never even turn it on! No wonder they don’t see speed improvements. And then I hear site owners say that because they are non geeks that they prefer to use a caching plugin that doesn’t require any setup. Unfortunately, none of those work worth a darn. But I guess it makes them feel better about having installed something. But, Apache is pretty slow unless it also has ngnix, which is a reverse proxy server and has better caching and load balancing on the server side. SiteGround (aff link) runs Apache with their own specially tweaked version of nginx. That’s why SiteGround also has their own server side caching optimizer plugin too. And, it’s why SiteGround’s shared hosting runs faster than the equivalent package at A2 Hosting, which uses Litespeed servers, tweaked with Turbo. I have heard some techs at SiteGround say that WP Fastest Cache is not compatible with their setup. However, I can’t get them to provide any written documentation on that. And, I was able to tweak that combo into the fastest possible site speed on shared in my head-to-head tests. So, when they show me the data, I’ll investigate it more and update my tests to suit. If you are on a straight nginx server, and using the WP Rocket caching plugin, you do need to get the WP Rocket-Nginx setup. I’m just now digging into all settings with WP Rocket, and they’ve changed things since I first read about this special setup, so do your own homework on that for now. I’ll have full tutorials for my Webmaster Training members as soon as I can. It’s going to take a lot of testing, so will be a while. Tests like this are also why I’ve incurred the added expense of having multiple hosting accounts for my testing sandboxes. The host type makes a difference in all manner of site setting tweaks. There is no single best host. The host that’s right for you is the host that best suits your needs. For super small sites, like an online brochure that has under 5k hits/mo, I recommend Pressable hosting if you want to use WordPress. And I suggest you consider something like Blogger too. WordPress is not the right fit for everybody. It is more expensive, but it’s faster. SiteGround is also very strict with their resource usage limits. That’s good because it keeps anyone else on the shared server from hogging all the covers. It’s bad in that you really need to have a fully optimized and secured site so that you don’t run the risk of overages yourself. In my experience, it’s faster than cloud hosting, which is the next step up at SiteGround. And, A2’s support is better as well, the majority of the time. They designed that package because I asked for it. We’re not hosting resellers and we don’t need something as big and expensive as VPS, which is typically the only way to get a reseller account. So far, I have not found a better deal on reseller hosting that’s worth a damn either. It’s very affordable and plenty fast enough the majority of the time, even though it is shared hosting. In your Facebook Live show you mentioned SEO and Google penalty regarding recipe ratings. It depends on the recipe plugin. There are many plugins that are no longer beinf supported for different reasons but as they still work until php 7 I see many not looking to change. The workaround for the rating glitch is simply to turn it off. But unless you are aware of the problem you are stuck. There are one or two new ones that recently were developed by a prominent dev of the top Studio Press recipe niche themes that reflect schema.org and JSON-LD recipe inclusion as well as fixing the rating system to show in the comment section for recipes only. The popular paid plugin I used previously included the rating on all posts. Thanks so very much for letting us know, Marilyn!!!!!! I know it has been a real struggle for recipe bloggers to keep up with all of the changes and find a plugin that meets them, plus looks good. The one from StudioPress sounds like it addresses everything. And integrating directly with Genesis is super!!! +1 for A2 hosting. In the last two years, I’ve used BlueHost, HostGator, ASmallOrange and A2Hosting. A2 wins hands down. One great thing about them is that they offer an optimized WordPress install. It has a bunch of security and speed fixes optimized for A2, such as obscuring the wp-login page and replacing it with a random set of letters. Highly recommend it for anyone. Puranjay, all those other hosts are EIG owned. Not hard to beat these days. Was so sorry to see ASO go that route. I would definitely recommend against installing A2’s Optimizer or letting any host do the WP install. You might want to check out my Webmaster Training to see how to install and secure a site properly.